I have been commuting for sixteen years. I have blogged about driving a few times (Cruise Control, We Can’t Always See). My oldest child will be a senior this year. Commuting has given me time to think about how fast the coming year will go and about all the things I want my son to know. There is so much about life I hope he is ready for. 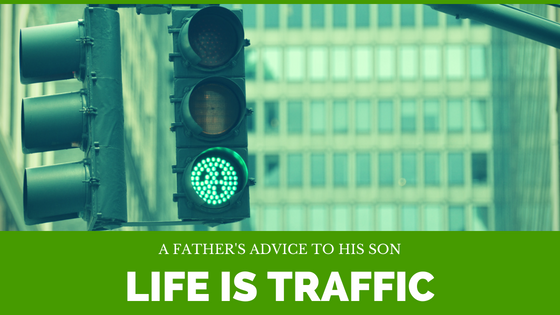 While driving I had this crazy thought, “Life is traffic.” This post is my fatherly advice for him. Understand that traffic laws, signs, and stoplights are designed for the safety of everyone on the road. The rules are not meant to hinder you, they are in place so that everyone will travel safely to their destination. Even the unwritten rules are meant to make the road safe for everyone. You are not the only driver. Be respectful of everyone else on the road. That is one of the reasons people lose their cool driving. Other people break the rules and disrespect the other drivers. It is true for life, too. We are all just trying to drive our own lives. Respect other people’s journeys. Use your turn signal, and turn it on before you are actually turning. Cruise control is only good for the open road. Once traffic gets heavy, drive your car. This also holds true for life. At times life will feel like a routine, but don’t fall into the trap of the cruise control. It is easy to give up control to the car or to a job. Don’t. Cars are meant to be driven. Life is meant to be lived. On that note, at some point, learn to drive a car with a stick shift. You will understand the true beauty of driving. You will feel the power of the engine, understand the art of shifting to higher gears. You will face the challenge of keeping the car running as you shift to first gear at a stoplight on an incline. An important part of life is learning to tackle the hard things so that we can live more fully. Step outside your comfort zone and you’ll find that there is so much more to experience in life. As in life, give people space while driving. Don’t tailgate people, or swerve right in front of them. Why? Reread the first point. Also, don’t spend 10 miles trying to pass. Turn off the cruise control and drive. Did I mention use your turn signal? When you travel, plan ahead. Know where you are going. Know what route you are going to take. I know some people will argue that you should just follow the open road, but I have been lost. And that is scary. By knowing your destination, by planning, you can then actually be spontaneous. You can take the back roads, or spend an afternoon in a small town, because you know where you need to go. I am not suggesting that you plan out your whole life, I know how unpredictable life can be, but I have always known what dreams and goals I wanted to achieve. Those have been my mile markers. Being lost, whether driving or in life, is a scary place to be. Always remember to call me if you ever find yourself lost. Accidents. Some will be your fault, but most will be the fault of others. You know that the two major accidents I have been involved with were because of someone running a red light. My advice is that you have to be alert while you drive. And then you have to be ready to handle the fallout from the accident: reports, phone calls to insurance, car repairs or replacements. Like many aspects of life, a single moment will cause a chain reaction for your future. Some of the effects are minor, others will set your life on a whole new direction. You will never see an accident coming. Don’t try to evade your responsibility, or responsibility for your life. Don’t ever drink and drive. EVER. Life is traffic. Respect people on the road and in your life. Try not to drive on cruise control for too long. Learn to drive a stick. Mom and I are here if you ever need a lift. And always use your turn signal.